Paul Hollywood is the ‘man of the moment’ as far as baking bread is concerned. I remember watching him on Good Food Live, he was a natural performer, something which has been confirmed by his popularity as co-host with Mary Berry on the Great British BakeOff. I reviewed Paul’s first book ‘How to Bake’ in November 2012 and at the time was surprised at the range of recipes included in the book. The same can be said of ‘Bread’, not only does Paul teach you exactly how to make a variety of breads, but for each one there is a spin off recipe which shows you how to make a fantastic meal of it. The book also ties in with the forthcoming BBC2 television series so you can also watch Paul make the recipes and then make them yourself. The book has six chapters, each with five bread recipes – plus the spin-off recipes for main courses. 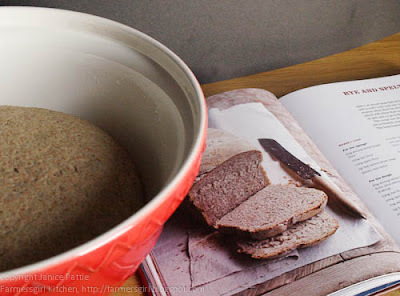 What sets this book apart from the other bread making books I own, is that each recipe has a comprehensive step-by-step guide in photographs. Soda Breads including: Stout Bread plus Smoked Salmon Pate; Cheddar and Rosemary Scones plus Beef Cobbler; Soft Treacle Parkin plus Parkin Crumble. Flatbreads including: Pitta Breads plus Souvlaki and Cypriot salad; Maneesh plus Baba Ganoush; Corn Tortillas plus Tortilla tower. Continental Breads including: Ciabata plus Panzanella; Pizza Base plus Parma Ham, Fig and Gorgonzola pizza AND Tartiflette pizza; a trio of Biscotti plus Biscotti with Hot Mocha dipping sauce. Sourdough: Sourdough Starter, Basil and Coriander Sourdough plus Roasted Tomato and Fennel Soup; White Chocolate and Raspberry Bread plus Summer Pudding with White Chocolate Cream. Enriched Breads: Danish Pastry Dough plus Emmenthal, Onion and Mushroom Pastries; Sicilian Lemon and Orange Sweet Bread plus Limoncello trifle; Lardy Cake. This book is ideal for both beginning bakers who will appreciate the step-by-step photographs and those who would like to expand their repertoire. I’ve been baking bread for a number of years but probably stick to the same recipes and reply too much on my bread machine. When I have a little more time I plan to try the sourdough and enriched bread recipes, I feel confident that following Paul Hollywood’s instructions I’ll be able to make these more complex recipes. 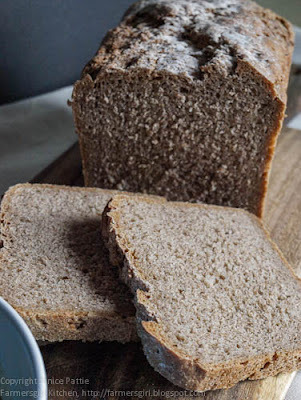 I made the Rye and Spelt Bread which uses the 'sponge' technique where you make a little bit of dough and leave it to rise overnight, then add the rest of the ingredients the next day. I've never done that before and was a bit trepidatious, however it worked perfectly well. The dough was left to rise again after kneading for 10 minutes. Once it had doubled in size, it was folded and then rolled and placed in the tin, then left to rise again. I used the one of the delightful Vintage Collection tins from George Wilkinson Great British Bakeware it is made in Lancashire and this premium range has an innovative & exclusive long life coating. GlideX is bonded directly onto your ovenware to ensure it keeps performing like new every time. It is scratch resistant, flake-resistant and virtually indestructible. Tested rigorously by Wilkinsons, GlideX outperforms all other non-stick brands. 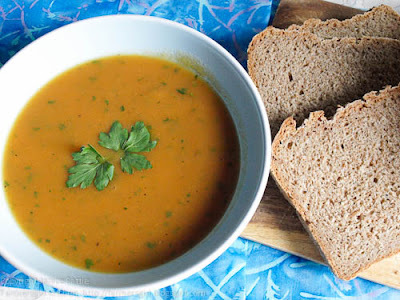 I served the Rye and Spelt Bread with Carrot and Coriander Soup. I do think the bread dough recipe could probably have done with a little more liquid, it is quite a tight, dense loaf. However, that may just be the rye flour. I will certainly make it again as it has a great taste and is good on it's own or with a little butter, and it makes very good toast. 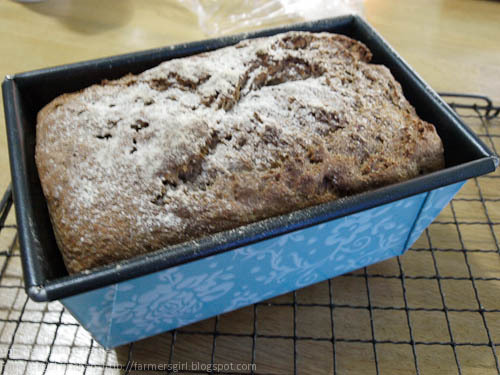 Lovely review Janice (and lovely loaf tin!). I already own How to Bake - bar the spin-off recipes, do you think this book offers much more in terms of 'bread' content? Thanks. Lauren - Thanks for your comments. There are more recipes in 'How to Bake' so if you are already a confident bread baker, this one wouldn't add much. However, the step by step photos in this one are for each recipe so would suit a beginner better. Does the book have step by step instructions for his 8 strand plaited loaf? I still haven't managed to decipher them off the web! I should get this book as I really am an amateur bread baker. I am loving your blog. I have only found it recently but am enjoying every post. 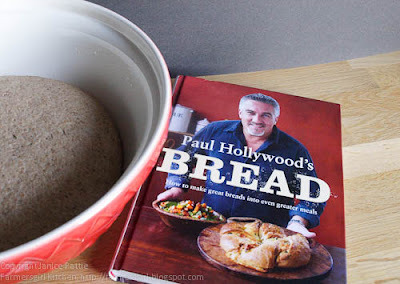 I live in Australia so don't know Paul Hollywood but your post makes me want to get his book. It sounds great! I am keen to learn to bake more bread and this sounds ideal. 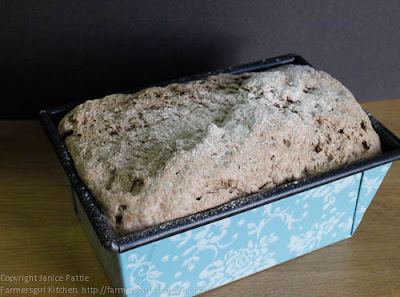 I've been wanting to learn how to make my own bread for quite a while now and after seeing that tin of yours I've decided I really need to start soon.... so that I can justify buying the tin! Elizabeth - the 8 strand plait is in How to Bake not this book. Div - that's great, those tins are not just pretty they do the job really well and are very non-stick. Sorry to hear you have been having difficulty with the loaf, maybe try less rye? The cold weather might be affecting the rise of the loaf too. I'm really not an expert, but my loaf seemed to turn out okay.